This video tutorial, for those who are new to Microsoft Excel, covers how to format numbers including changing the number of decimal places, adding currency signs, comma separators for 000's, and percentages. Date and time formatting is covered separately in Tutorial 7. Further explanation of number formats is provided in the table below. The tutorial also shows how to access the Format Cells dialog box (see figure 2 below) by clicking the small box in the bottom right corner of the format number area of the ribbon (see Figure 1 below). 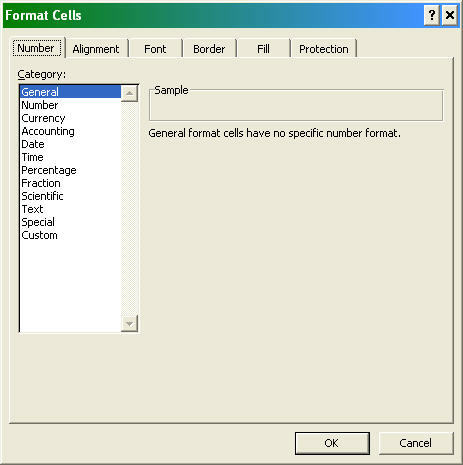 The Format Cells dialog box provides a greater choice of different number formats. When you click on the button, highlighted above in Figure 1 above, the "Format Cells" dialogue box as displayed by Figure 2 will open. An ability to use correct number format in Excel in most important in creating worksheets that display professionalism. General 123 No specific format (default). The number of decimal places displayed will be exactly the number you type. You can alter the number of decimal places if needed using the technique shown below. Currency $123.00 All numbers will display 2 decimal places and have a currency sign in front (i.e. $, £, fr.). You will likely use the currency format very often if your spreadsheet is for budgeting and financial management purposes. Accounting $ 123.00 Much the same as currency format except the dollar sign will appear on the left of the cell instead of next to the number. Percent 123% You will like utilise the percent format very often particularly when constructing spreadsheets for financial management. Long date Friday, 11 May 2012 This date format is very useful when construction work schedules, class timetables and calendar of events. The format will be expressed in the form of ddd, dd mmm yyyy (Note the effect of the extra "m" which changes the display of the month from "05" to "May". Time 5:31:12 PM The time format is also useful when constructing work schedules, time sheets and timetables. One of the reasons why it is important for you to be familiar with the Format Cells dialogue box is that you will often want to change the number of decimal places displayed.